Chairman Norris as NAISA Alley and Speaker? With Friends Like That Who Needs Enemies? 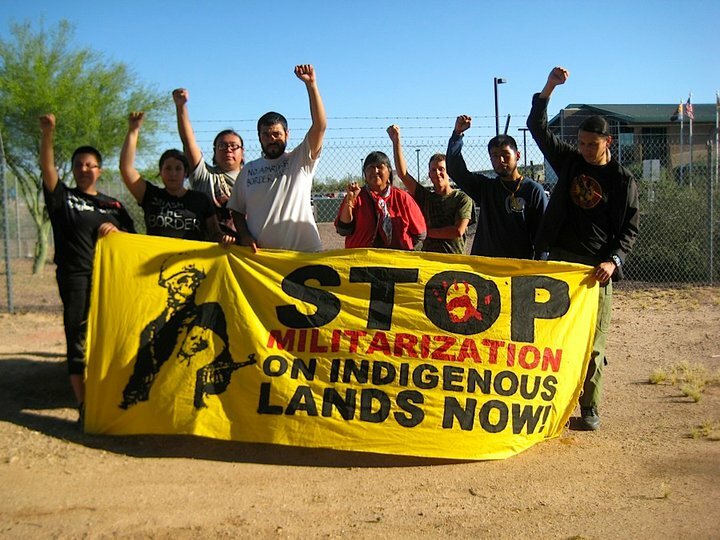 Scuckson (Occupied Territories of Tucson, AZ) -- On June 1, 2010 at 8:30AM (MST) the 6 peaceful resisters who locked down and occupied the Border Patrol Headquarters in Tucson, AZ on May 21, plead not guilty to charges of Disorderly Conduct and Criminal Trespassing at Tucson City Court. At this point no trial date has been set, and additional court proceedings are anticipated at the end of June and the beginning of July. More than a dozen peaceful resisters, six of whom used devices to lock-down, occupied the Border Patrol Headquarters to demand that the Border Patrol, the Department of Homeland Security, and the Obama Administration end border militarization. The occupation lasted more than 4 hours while 70 supporters were outside protesting border militarization in solidarity with the six people locking down. 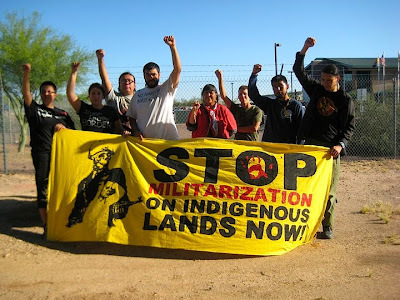 We reaffirm our opposition to border militarization and racist laws such as SB1070. We are committed to direct forms of action that uphold human dignity and respect. Terrorizing and destroying Indigenous communities, as well as the criminalizing of migrant communities, through racist legislation such as SB1070, must end. In the past 10 days, since the peaceful act of resistance, the Obama administration has chosen to further military aggression against Indigenous & migrant communities by adding $500 million for "enhanced border protection and law enforcement activities" and mobilizing 1,200 National Guard Troops to the US and Mexico border. Even still, Arizona Senator John McCain threatens to double the number of troops in the borderlands. We are making a non-exclusive call for affinity to those who stand in solidarity with us and others who take direct action against border militarization and the criminalization of our people. - Hold Janet Napolitano and the Department of Homeland Security accountable to its attack on indigenous/migrant communities. 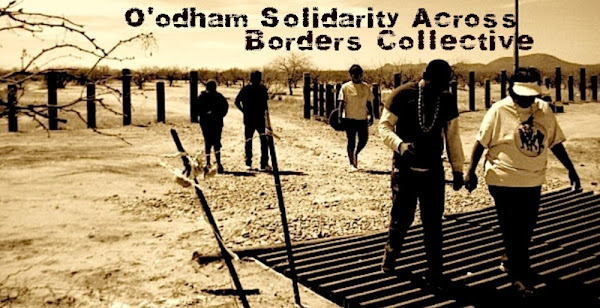 O'ODHAM SOLIDARITY ACROSS BORDERS COLLECTIVE is made up Akimel O'odham and Tohono O'odham youth who are pressing the attack against the ongoing colonization of our traditional lands (i.e. U.S./Mexico Border policies), environmental racism from transnational corporations and the state, and all colonial polices aimed at destroying our O'odham Him'dag (Traditional Way of Life). We fight for self-determination, and true sovereignty of our lands. We advocate for the traditional elders in Mexico and the United States. We provide an autonomous space for O'odham to educate themselves on the issues that affect our land and people (our future). We encourage and support all O'odham, especially the youth, in carrying on our traditional practices, just as our ancestors did before us. Our projects of solidarity are our politics. You dig? Hit us up! We'll fill you in. Waila! Making The People Happy! Phoenix, Tucson and SF Reports from the May 6, 2009 International Day of Action: "No Toxic Dump or Border Wall on O'odham Lands!" East Palo Alto and Gila River Unite!